Artificial intelligence (AI) is rightly being called one of the most transformative technologies in human history. Systems that are intelligent and adaptable will make it possible to accomplish and understand more than has ever been possible before. The repercussions for business are huge, but the impact is likely to reach every corner of humanity. It's appropriate to talk about AI excitedly, but it's also a little misleading. The promise and potential of AI is huge, but it's not going to change the world overnight. It's also not going to solve every hassle or headache that companies deal with. AI is a powerful tool, but it's not a panacea. The global AI market is worth around $2.5 billion right now, and by 2025 that is expected to balloon to over $59 billion. This is a highly lucrative corner of the tech market that is being flooded with startups and new offerings. At first that might seem like an advantage to companies that are eager to upgrade their technology. In reality, however, it means the market is crowded with unproven solutions with limited utility. These technologies make use of advanced AI, but only to solve very discreet problems and handle self-contained processes. The revolutionary approach they promise to deliver is a lot more limited than advertised. Companies are understandably eager to implement AI. But when they choose the wrong solutions for the wrong reasons, automation provides little ROI. Companies end up over-investing in technologies that are hard to implement and even harder to leverage. By racing to the cutting edge, they end up falling off the cliff. There are clearly risks to adopting AI too soon and picking the wrong solution. But there are equal risks to rejecting AI outright and falling behind the competition in terms of technology. The first step is to develop an honest use-case scenario. AI products are available in every shape and size, but only some address a company’s core needs and wants. Instead of automating everything, companies must target things, like finance and accounting, that involve tons of manual input yet have huge consequences due to delays, errors, or inaccuracies. After understanding where and why AI is really necessary, the second step is to seek out AI providers who are leading the industry. That does not just mean offering the most advanced solutions available. It also means offering the most integrated, intuitive, accessible, and affordable solutions available. The leading providers ensure that AI is a solution and not just an innovation. Sage Intacct is a great example. As one of the only true cloud accounting and financial management solutions for the middle market and above, Sage Intacct has built a robust foundation for companies to automate processes and surface metrics and insights via powerful dimensional reporting. Sage Intacct is also a company made up of visionaries who are working to incorporate AI into the system in the best most accessible way specifically for finance and accounting. The company is already developing anomaly detection and working to incorporate AI bots into Sage Intacct Collaborate, the social layer based on Salesforce's Chatter application that lets users of the finance and accounting system communicate directly on specific journal entries, accounts, projects, invoices, purchase requisitions, and more. These bots will be able take on tasks users assign to them and will monitor conversations to make suggestions or answer questions. This kind of AI focused specifically on the workflows of finance teams could change how we look at accounting. Being an early adopter of new technology can be a great opportunity. But don't go down the Artificial Intelligence rabbit hole looking for one-off solutions to problems you haven't had the time or resources to truly evaluate. 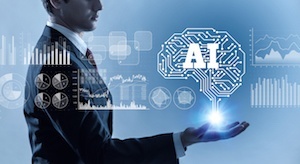 Consider adopting solutions like Sage Intacct that have their functionality firmly planted in the present but also have the vision and product roadmap to take you into the future promised by AI. Find out more by contacting AcctTwo.